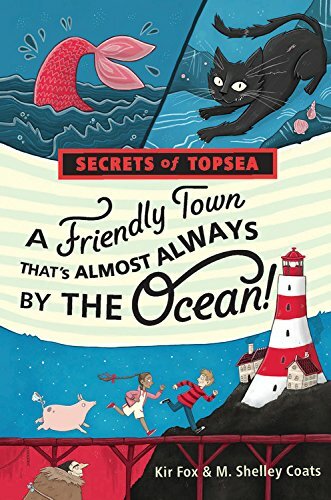 Dad of Divas' Reviews: Book Review - Secrets of Topsea: A Friendly Town That's Almost Always by the Ocean! 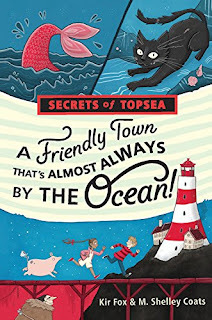 Book Review - Secrets of Topsea: A Friendly Town That's Almost Always by the Ocean! Davy Jones is a new 5th grader at Topsea School. Davy notices right away that this town and the school are very unusual (at least to him). For example seaweed can be found in your bed around your feet, in your cereal bowl and you can expect to be served seaweed burgers on a seaweed bun in the school cafeteria. The reader will get to know Davy's new friends. As the friends play together you will learn about the town : the water park that often is not open, the closed arcade that the kids can get into, and there is the lighthouse in the middle of town with no doors but there is a lightkeeper living there. And more! Some of the adventures are when Finn was stuck to the chewing gum wall. Another one involving Finn and friends was the running on the boardwalk and an old woman (troll) who lives under the boardwalk gives Finn a bell. What is so great about the bell is that Finn who has a quiet voice, can now get the attention of his friends by ringing the bell. I enjoyed that chapter. In spite of all the strangeness of Topsea, Davy and his mother seem to begin to settle in and adjust.Davy continues to ask questions and may be confused by events, but the kids at the school accept him as a new friend by the end of the book. The authors have really used their creative powers in this book.